In this digital age, if you’re not in common terms with the latest technology or music platforms, then your music career may relapse even before shooting for the stars. No one can be dubious about the fact that the landscape of music has taken a huge paradigm shift lately, with cyberspace becoming the most prominent tool for networking and advancing music career. This giant leap in technology has created an elementary course for aspiring musicians to connect and collaborate with people sharing a common vision. There’s no denying that these music platforms and social media is the best way to popularize and amass more fans. But most musician still hangs themselves back from leaping on these bandwagons, fearing that they would become a small fish in this huge ocean full of Sharks. Though this is a common knowledge that anyone with a voice and talent can jump on this carnage but it’s not an easy endeavor to create an online presence with millions of fans, as it looks from the surface. With tons of music platform and social media sites breathing online, it becomes virtually impossible to steer all. 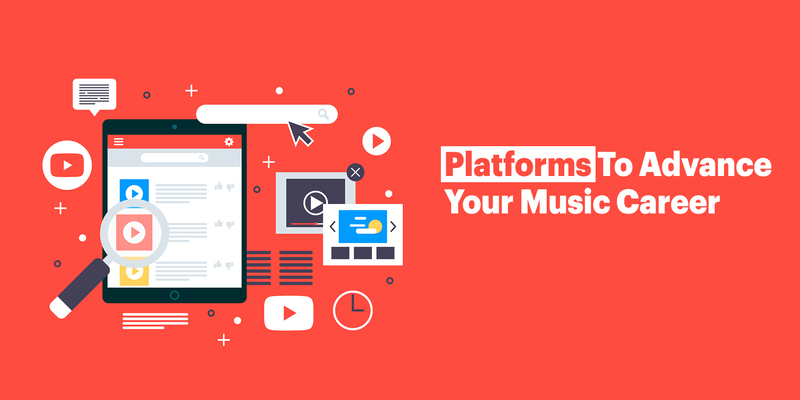 So, to help you lean down these despondently colossal number of community-based websites, we have mentioned the platforms which should be given your utmost priority if you wish to be a great artist. Climbing up the ladder, Instagram has quickly risen from the bottom to become the most admissible social media platform for artist all around the globe. To compete with its strict algorithms, be sure to use great-quality videos/photos complemented with perfect captions and tags. To make your voice be heard by millions of its users out there, it has also segregated its search page into a number of genres including arts & music. With Instagram, you have this perplexing opportunity to directly message the artist of your dream asking for a collaboration, or can invite people to feature you on their page. You can easily connect with your fans and be more relatable with Instagram live. With its massive IGTv update, Instagram sparked a new wave of curiosity among content creators and producers. All the aspiring artist and content creators can now reap the benefits and reach more people through its video platform. You can upload your clip of your band performing or share a small story to engage and connect more with the audience. It’s not a common knowledge that Youtube has successfully launched the career of most of the world’s famous artist out there. From Justin Bieber to Indian rock band Sanam, they have all made a mark through this platform. With YouTube, you don’t need much of an initial investment or backing by a huge label to start your journey, all you need is a burning desire and persistence to put your best work out there. And With viewers count reaching almost 100 mn users, your music is sure to hit the right note. Tip- Competition on YouTube is fierce, so, don’t be disheartened by the initial disappointment. Instead, focus on making your content more meaningful for the audience. Not only does Reverbnation provides a platform to the artist to showcase their hard work but also connects them to festivals, venues, publishers, labels, and fans all around the globe. Reverbnation also offers high-quality career management and online marketing tools to the independent artist. Once you join its platform, Reverbnation allows artists to set up their own website and compels them to share and promote their music more and more. Advance features of Reverbnation include getting your music distributed to websites like iTunes, Amazon Music, Beats Music etc. SoundCloud has successfully forged the biggest audio and music platform in the whole world. All the musicians can put their best work and be a part of the biggest community of artist and fans in the world. Kygo and Kehlani, are just one of many artists who has made a career in music using SoundCloud. Through SoundCloud, you can also earn revenue every time a user plays or downloads your music. SoundCloud gives out a monthly percentage of earnings made from subscribers or advertisers to the artists. While platforms streaming platforms like Youtube, Saavn, Spotify, they are primarily search platforms. Listeners go to them to listen to their favourite songs. So, you may release your music on any of them but it tends to get lost in the sea of new content being uploaded everyday and popular music keeps getting more popular. Songdew is the only music discovery platform. Listeners at Songdew come with a focus to discover new music which is why this platform should be our utmost priority for music. But not just that, Songdew provides artists various tools to promote their music on different platforms. Using modules like the ‘Opportunity’ Module, any band can jumpstart their careers getting 20+ industry opportunities to chose from every week. Songdew realized that millions of Indians are still stuck to watching TV when it comes to enjoying music, and thus, launched Songdew TV. Songdew TV is the only music channel in India focused exclusively on independent music and is currently reaching 40 Mn Households. Songdew has built an eco-system to help artists and their creations thrive. This is not your everyday social media promotion guide, and if you follow these steps persistently, your music career is surely going to get advanced.